The first PTƟ Assessment of the 17+ UN SDG 2030 suggested that there is a focus attention on the importance of the element earth-3 as SDG Foundation. The first PTƟ Assessment give us a first set of question for the study of phenomena, identification of topics necessary for a research process that would bring us to innovation, development of PTƟ Algorithms that will enhance effectiveness in the field of work. In this case the first assessment of the 17+ UN SDG 2030 brought us clarity regarding the focus the SDG have in field earth-3. A review of the aspect of the goals that are necessary for the development (generation), stabilization and enhancement of its holistic development. A brief overview on the systemic matrix complexity of the 17 SDG and their relationships of interaction. 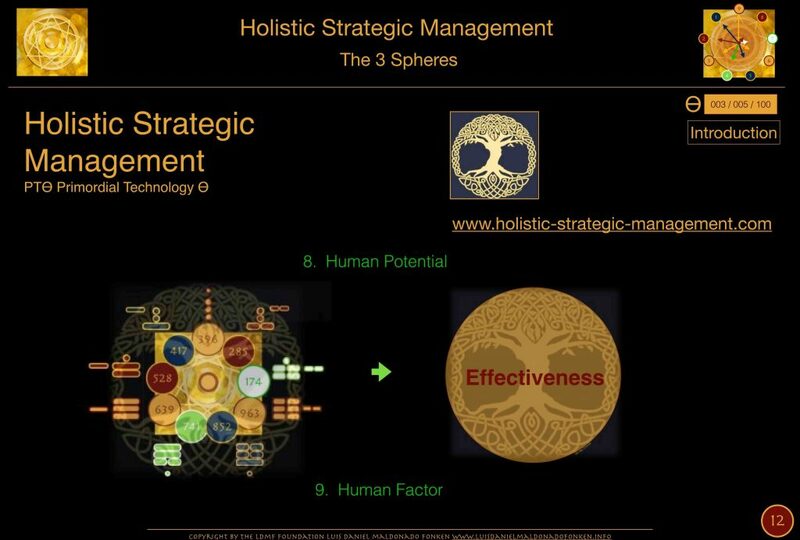 In the following images some keywords and [rinciples are suggested regarding how the 9 fields of study, of PTƟ Know how, its 3 triads, are utilized for assessment in the field of holistic strategic management. 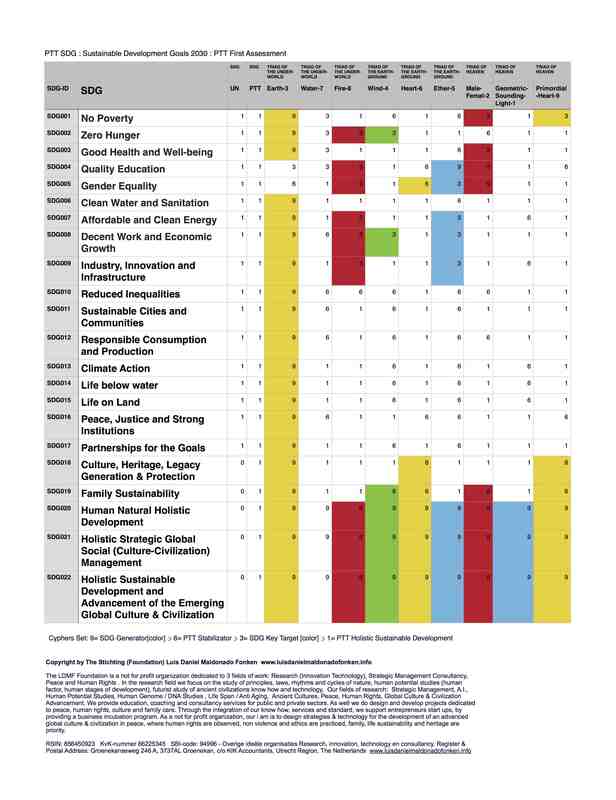 Also the chart example on the first PTƟ Assessment on SDG. It is important to remark how the UN decided that these 17 goals for sustainable development need to be promoted. 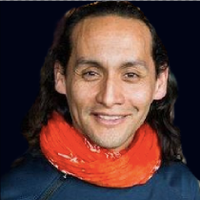 A democratic process in essence, when organizations, stakeholders, globally, share with the UN global information and collaboration structures and institutions on their concerns and wishes for achievement of an advanced quality of living, wealth generation, technology, culture and civilization advancement, legacy. Their focus, concerns, expectations and needs to be solved, perceived as urgent, important and necessary priorities have been more or less described by the SDGs. In essence, a great concern has been suggested in the field of the TRIAD of the UNDER-WORLD, which focus on the ability of survival. For the triad of the underworld to reach stability the sustainable development in the fields of the three elements need to be mastered: earth-3, water-7 and fire-8. Yet we observe after the first assessment that focus is given to the earth-3 element. It is obvious that the main concern is on the earth-element, and all it means in terms of safety, security, defense, stability, nurturing, protecting, health, community, family care, culture development, government, leadership, happiness, wealth generation. As all that is involved with the earth-3 is perceived by humanity globally as the priority most direct source of wealth, which is extremely important for survival. Yet, money, property or wealth along are not enough. Without creative thinking, transformational processes, communication, production, without information, emotional engagement, process, money, funding, financial means, property, will not be wisely utilized in an holistic manner. Wealthability, Property, Money, Peace & The Earth Element from The LDMF Foundation on Vimeo. 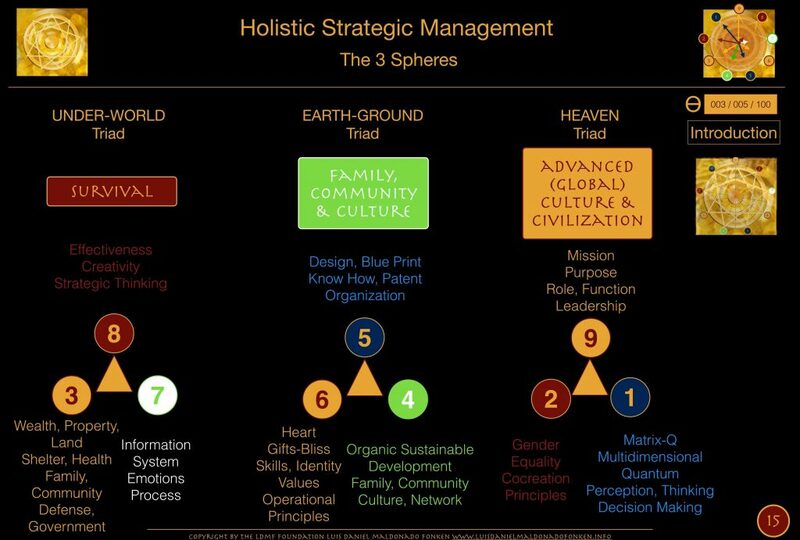 But when we are thinking in terms of a Matrix-Q type of solution, systemic, holistic, synergetic, and we wish also for the development of an advanced global culture and civilization, we look for a development complex as described by the 3 spheres of holistic strategic management. As for organic natural development process, quality of the wind-4 element, the activities, tasks, goals associated or included within the field of phenomena known as the triad of the earth-ground, triad 02, will be brought to an advanced development, only of the triad 01 of the under-world have reached stability. In our modern culture, complexity in field of management and organizational development is noticed in its core challenge at the human factor and human potential aspect of the organization, when mission statement is being studied and effectiveness of an organizational model is studied from records of history, previous trials and human experience. 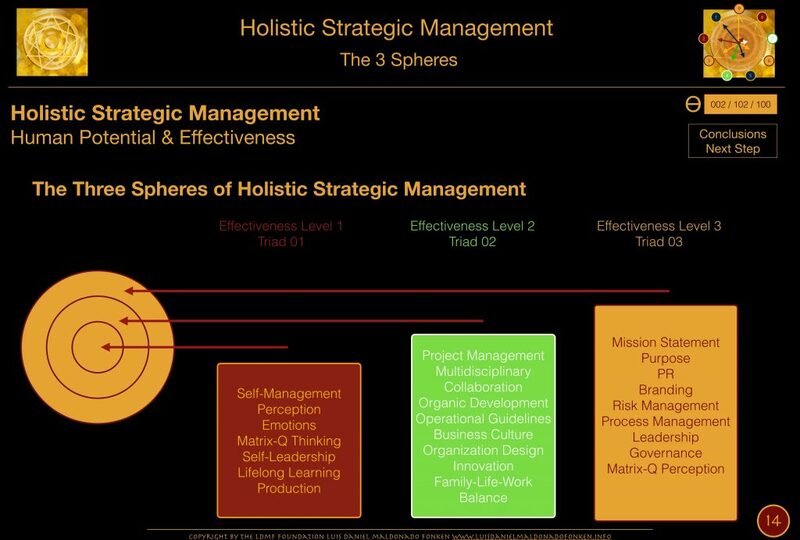 Adding to this complexity the 9+ types of organizations, suggested by PTƟ Holistic strategic management know how www.holistic-strategic-management.com an organization may develop expertise in field strategic management and effectiveness in one or more of the 9+ fields. QUOTE: From our introduction to SDG11 New book on PTƟ Holistic strategic management know how applied for SDG. There are at least 9+ fundamental types of organizations (or complex human systems, listed above). Type 03: material means, earth-3. Type 07: information systems, emotions and process awareness, water-7. At this stage the reader may realize that an organization may be unidimensional if focus in only on type, for example type-7, its design, focus is on emotions and information. 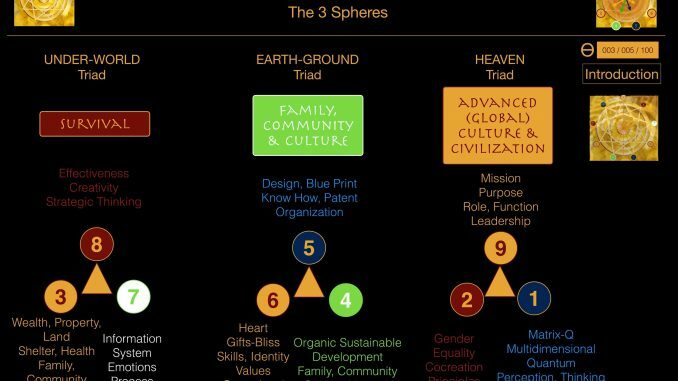 But if has a bi-dimensional design, may focus on two fields, for example: in the triad of survival, earth-3 and fire-8, the most known combination in our modern culture, creative strategic thinking, production, wealth and property. 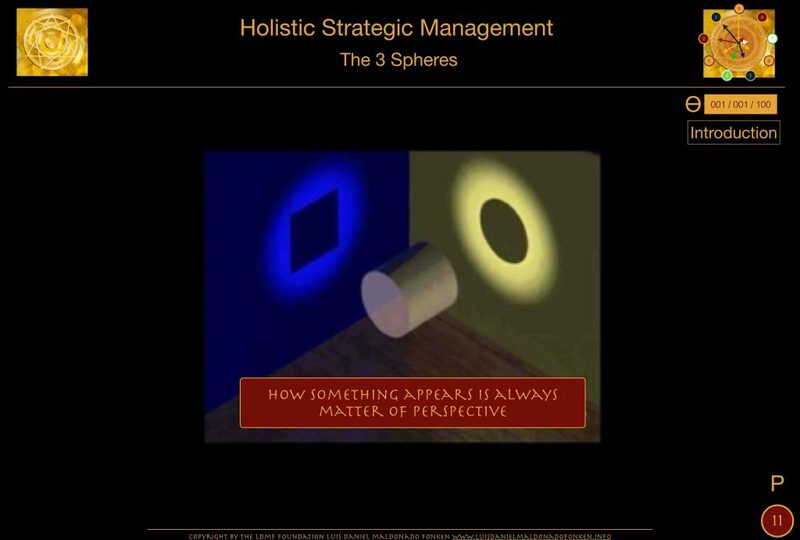 A tri-dimensional system, or multidimensional system will follow, when more than 2 fields are included for holistic strategic management. In our modern culture, most of organizations are Type38 (earth-3, fire-8), modern corporate intents to become a Type387 (earth-3, fire-8, water-7). A complete and advanced organization would by the type Ɵ, for example: Type:123456789 in which the three triads are in sustainable developed and in balance. Sofisticated corporate type of organizations very close to type Ɵ are for example religious organizations, military and governments. Why should a small company, city, clan, or corporation intent to evolve to a type Ɵ of organization ? WHY IS IT IMPORTANT TO IDENTIFY THE TYPE OF SDG ENTREPRENEURIAL PROJECT you are working on? 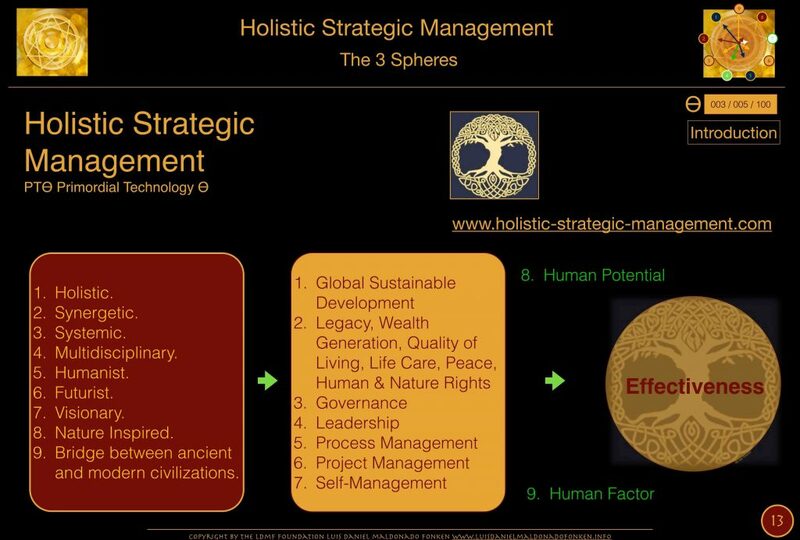 For a basic analysis on strength, weakness, opportunity and threats experienced in the SDG Project, the study of the 3 spheres of holistic strategic management is paramount. If a project expertise is unidimensional, the strategies necessary to advance the capacity of the organization towards a multidimensional, matrix9+ capacity, which involve the 3 spheres is necessary to be planned and implemented accordingly. In order to identify the inter-relationships between the triads, elements and spheres the study of primordial mathematics is essential. How does an SDG Project Type 3 impact an SDG Project type 5 and when an SDG Project type 7 needs of SDG project type 4 skills in order to achieve stability for the development of a SDG Project type 6. Why SDG project type 8 alone is not enough for achieving completion of the 2 first primordial spheres of the holistic strategic management and why gender equality is so important for stability of the third sphere and achievement of stability and sustainable development of the triad of heaven. While the language utilized in the paragraph above may look cryptic, it is essential, and as any technical language, useful for the purpose of holistic strategic management and advancement of effectiveness of team, leadership, organization and city management. The application of PTƟ assessment tools vary according to field of study, discipline or multidisciplinary nature of a project. In principle, PTƟ tools and know how, help leaders identify and create bridges between all the fields of expertise and through a matrix-Q type of assessment, develop an holistic strategy that would advance the sustainable development of the organization in collaboration with the sustainable development process of a city, region, nation or global sustainable development. Leaders with a wider understanding of the inter-relationships of their own organization development, business or project, and that of their region, city, in terms of sustainable development with an holistic approach, will be capable of decision making which will reduce conflict between entrepreneurial projects at location, enhance collaboration, reduce use of resources, optimize process, make easy communication, advance effectiveness, within the field of each element, triad and sphere of holistic strategic management. The systemic perception of SDG through the PTƟ tools helps to develop an advanced understanding of the UN 2030 17+ SDG according to their types, and impact they cause on each other, and the strategy necessary for the process of achievement. As well, to implement strategies that will help SDG entrepreneurs specialized in one or few of the SDGs, and with an expertise in any or some of the SDG Entrepreneurial types described in this presentation, identify challenges and opportunities for collaboration between each other, their cities and locations. In the following 2 documents, both topics will be studied. As well another example of first assessment, here, would focus on democracy as a social management and decision making strategy, and the alternative upgrade fields that can be considered for a more effective social management and leadership. In the e-book on Primordial economy, as well a new idea on economy and effectiveness is suggested.